JAMES DONALD CAMERON was born in Middletown, Pennsylvania, on 14 May 1833; graduated from Princeton University in 1852; clerked in the Bank of Middletown founded by his father, Simon Cameron; moved up to cashier and finally president of the bank; married Mary McCormick, who died in 1874; during the Civil War supervised the transportation of Union troops over the Northern Central Railroad, one of his father�s enterprises; was president of the railroad from 1863 to 1874; was active in coal, iron, and manufacturing interests; joined with his father in dominating Pennsylvania politics; was a delegate to the Republican national conventions of 1868 and 1880; served as Secretary of War, 22 May 1876�3 March 1877; requested legislation requiring contractors to stand on their bids for specified periods of time; requested authorization to devote a portion of the funds allocated to publishing War of the Rebellion records to the preservation of the Matthew Brady photo collection; was elected to fill the unexpired term of his father in the U.S. Senate after his father resigned to make way for him, 1877�1879; was returned to the Senate for three terms, serving from 1879 to 1897; married General Sherman�s niece, Elizabeth Sherman, 1878; was chairman of the Republican national committee, 1879; retired from public life to live on his Lancaster farm and devote his time to private affairs; died on 30 August 1918. 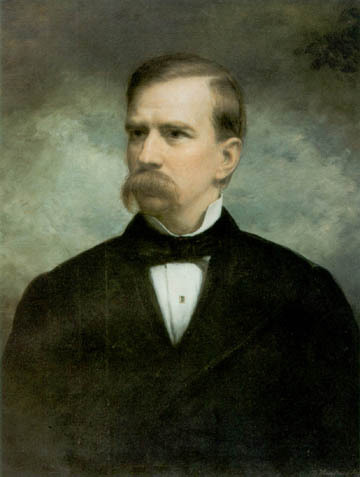 Daniel Huntington (1816�1906) made his mark upon the Army�s portrait collection not only in the number of paintings he executed but also in the variety and distinction of his subjects. In addition to his contribution to the secretarial line of succession, he painted two distinguished Revolutionary War soldiers, George Washington and Horatio Gates; one notable Mexican War commander, Winfield Scott; and three eminent Civil War leaders, Ulysses S. Grant, William T. Sherman, and Philip H. Sheridan. All but Washington had direct official connections to the administration of the War Department. Huntington�s portrait of Secretary Cameron was painted from life.